Chesapeake, Virginia – January 28, 2019 On Saturday, RRMM employees John Maddux, Chris Crouch, Josh Gerloff and Steve Childs, as well as their spouses, attended the annual Chesapeake Regional Health Foundation Gala at the Chesapeake Conference Center. John and Chris both serve on the board of the Foundation, with John additionally serving as Gala Chair for the past five years. RRMM Architects and Design Build were the dinner sponsors for the evening. 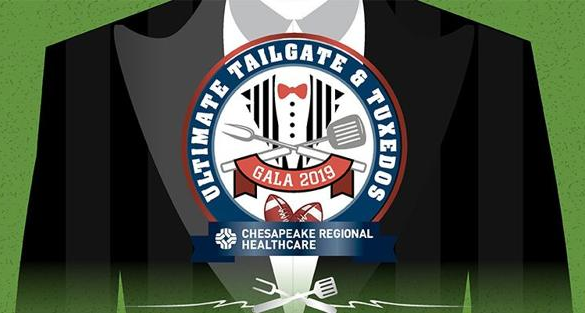 This year’s theme was Ultimate Tailgate & Tuxedos, inviting attendees to sport their favorite jersey with their black-tie attire. This year’s Gala raised money for the Interventional Neurology Suite at Chesapeake Regional Medical Center, with a portion of the proceeds benefitting the foundation’s endowment. The hospital is building a neurovascular suite that will host cutting-edge technology, enabling them to perform life-saving surgeries on stroke patients.